Old Pension Proposals for AP DSC 2003 Teachers from CSE Rc 115, AP DSC 2003 Teachers Old Pension Proposals from CSE Rc 115. DSC 2003 Old Pension Proposals from CSEAP to Govt. State Employees Contributory Pension Scheme Reminder. Rc. No. 115/Pension-1/2016, Dated: 09/02/2018 Sub :School Education - State Employees Contributory Pension Scheme - Reminder - Reg. It was not mentioned in DSC notification Later, It was mentioned In next DSC 2006. 2. Govt. Momo. No. 184573/Ser, W/A1/2016, dated 21.03.2016. 3. Representation dated 16.03.2016 from M. Veera Brahmam, Official representative of Rastra Jatheeya Upadhyaya Parishath, Kadapa. 4. Govt. Momo. No. 189013/Ser. 11/A1/2016, dated 21.03.2016 together with enclosures Lr.No. 513/PS/MHRD/2016, dated 08.03.2016. 5. Lr.Ro.No. 115/Pension-1/2016, dated 26.04.2016 of this office. 6. L.Ro No. 2087/C6/2016, dated 23.04.2016 from the District Educational Officer, Ananthapuramu District (Copy enclosed). 8. Lr.Ro.No. 709/05/2017, dated 18.02.2017 of the District Educational Officer, Visakhapatnam District. In continuation to the referente 9 cited, I wish to submit that, the petition presented by Dr. Gade Srinivasulu Naidu and Sri K. Narasimha Reddy. 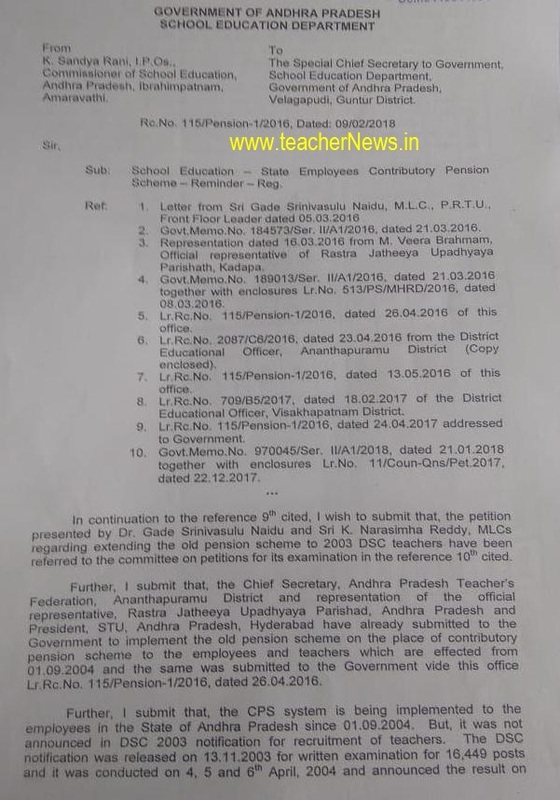 MLCs regarding extending the old pension scheme to 2003 DSC teachers have been referred to the committee on petitions for its examination in the reference 10th cited. Further, I submit that, the Chief Secretary, Andhra Pradesh Teacher's Federation, Ananthapuramu District and representation of the official representative, Rastra Jatheeya Upadhyaya Parishad, Andhra Pradesh and President, STU, Andhra Pradesh, Hyderabad have already submitted to the Government to implement the old pension scheme on the place of contributory pension scheme to the employees and teachers which are effected from 01.09.2004 and the same was submitted to the Government vide this office Lr. Rc.No. 115/Pension-1/2016, dated 26.04.2016. Further, I submit that, the CPS system is being implemented to the employees in the State of Andhra Pradesh since 01.09.2004. 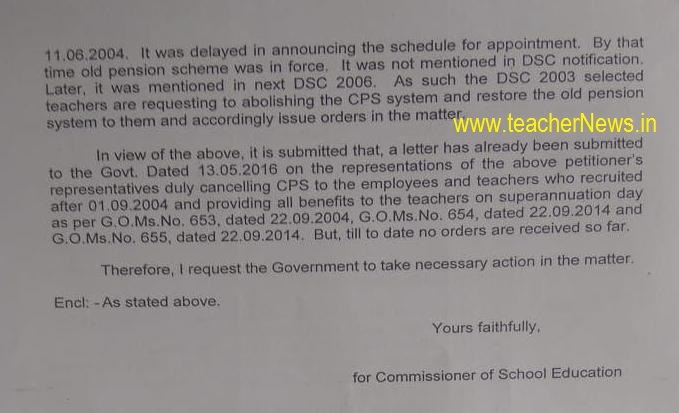 But, it was not announced in DSC 2003 notification for recruitment of teachers. The DSC notification was released on 13.11.2003 for written examination for 16,449 posts and it was conducted on 4, 5 and 6h April, 2004 and announced the result on 11.06,2004. It was delayed in announcing the schedule for appointment. By that time old pension scheme was In force. It was not mentioned in DSC notification Later, It was mentioned In next DSC 2006. As such the DSC 2003 selected teachers are requesting to abolish, the CPS system and restore the old pension system to them and accordingly Issue orders in the matter. In view of the above, it is submitted that, a letter has already been submitted to the Govt. 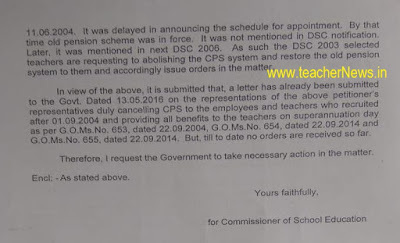 Dated 13.05.2016 on the representations of the above petitioner's representatives duly cancelling CPS to the employees and teachers who recruited after 01.09.2004 and providing all benefits to the teachers on superannuation day as per G.O.Ms.No. 653, dated 22.09.2004, G.O.Ms.No. 654, dated 22.09.2014 and G.O.Ms.No. 655, (fated 22.09.2014. But, till to date no orders are received so far.Therefore, I request the Government to take necessary action in the matter. AP DSC 2003 Teachers Old Pension Proposals from CSE Rc 115, Old Pension Proposals for AP DSC 2003 Teachers from CSE AP.